Parts of Nubia are a virtual open-air museum of mediaeval fortifications where successive generations and cultures have left samples of military architecture ranging from walled villages to imposing castles. Many of these works belong to the Islamic/Turkish period; most of the earlier Christian works were rebuilt or heavily modified in this era, adding to the difficulties of cultural identification. In this, the Muslims were only following the pattern set by the Christians, who had in their time rebuilt Pharaonic, Kushite, Meroitic and Roman structures. Unfortunately, these important works have received scant attention from professional archaeologists. Proper surveys are rare and full-scale excavations almost unheard of. Our knowledge of many of these sites relies upon the observations of civil and military officials of the Anglo-Egyptian Condominium who, with varying degrees of skill, attempted to date the ruins they came across on the basis of ceramic remains or brick-types. It is therefore entirely possible that upon closer investigation many of the sites identified in this paper may belong to other periods than those cited, and may likewise possess designs and features dissimilar to those described. The earliest of the Christian period walled settlements are notable for the strength of their walls and the apparent planning involved in their construction as fortified towns. This type is exclusively found in the northern extremes of Nubia, and its development is likely a response to the proximity of Egyptian military power and the raiding of regional nomads. In the Dal district there are two major sites, Tiine and Sheeragi. Tiine is a Late Christian settlement, built on a steeply rising island slope. The east side falls away in a sheer cliff. A semi-circular series of walls adapt to the contour of the hill, creating numerous small enclosures. The repetition of walls down the sloping face provided added defensive protection and a buffer against rock falling from higher levels of the site. Sheeragi also occupies a granite outcrop. Within a stone wall are dozens of houses and two larger works made of granite and schist, which may be the remains of a two-storey house. From the evidence of ceramic remains and earlier levels of construction underneath the two-storey houses, it appears that these works are typically Late Christian, mostly of the 13th century. The two-storey house is common in the last Christian occupation phase of many settlements, and was often converted to other uses in the Islamic period. The construction of sturdy two-storey buildings was made possible in Nubia through the use of brick vaulting, which was highly suitable for supporting upper stories of some weight. The walls are at least 80 cm. thick and are entirely constructed of brick, with the exception of several examples that use granite blocks in the lower courses. Doorways are present at the ground level, but these are in all cases but one post-Christian modifications. Unique storage crypts are common to these structures, entered only through hatchways in the upper floor and often possessing their own brick vaulting. Secret crypts are often found cleverly concealed in the walls and other spaces of the building. The purpose of the two-storey houses is not as clear as it might seem at first. Adams has noted a conspicuous lack of domestic evidence (mastaba-s, fireplaces, buried pots in the floor, etc.) and the absence of accumulated dwelling refuse  despite a clear similarity between the upper floor plan and the plan of contemporary Nubian houses. Use as a communal storehouse or granary has been suggested , but again there is little evidence for such use of these buildings other than their suitability. Nevertheless, the design and popularity of these works suggests that they were intended to protect goods from attack and make access as difficult as possible for those unfamiliar with the design. A curious feature is that the ratio of two-storey houses to settlement population size is widely inconsistent, with some tiny communities having a number of examples, while larger towns may only have one. This would seem to out-rule their use as civic buildings or feudal-style residences. While in continuous use as watchtowers, the two-storey house were probably reserved for emergency use by the community. The number of such structures may reflect the prosperity rather than the size of the community. The structures referred to here as “blockhouse” fortifications are not clearly distinct from the two-storey house, and are in most cases an elaboration of this basic structure. Nubia was already an ancient land at the time the Christian kingdoms emerged and was wealthy in useful ruins, many of which were finely preserved. In many cases the Christians inherited fortified sites on hilltops from their military predecessors, such as at Jabal Adda and Qasr Ibrim, where Meroitic fortifications were re-used..
Jabal Adda: The Late Christian occupants of Jabal Adda relied mostly upon the Meroitic-era wall for defense, adding a new stone gate and making minor repairs. The so-called “palace” may have had a defensive intent, as well as serving as a royal residence. Some of the ruins may represent a pair of two-storey houses. The fortress was taken by the Mamluks in 1276 C.E. In retaliation for a Nubian raid in 1172, an Ayyubid army under Shams al-Dawla Turan Shah laid siege to Ibrim, which fell after only three days. The town was laid waste and passed temporarily into Muslim hands. Significant Christian forts are found at Tanujur Island and Susinarti. The former is simple in plan, consisting of a dry stone wall around the peak of a small hill and mud=brick structures within. Susinarti is far better built and designed – here a triangular wall faces onto the Nile in the south, the other two arms running up the side of the hill to a large tower-keep. Towers dominate the other two corners. Both of these forts rely unpn ceramic remains for their Christian period dating. Sai Island: This highly strategic island at the southern end of the Dal Cataract is the site of another constantly re-built fort, from Napatans through to the Turks. Vercoutter, the excavator, believes the fort may have been a very late Christian stronghold against the Arabs,  but points out that the late Christian dating relies upon its similarities to other Christian forts in the Nile Valley. Khandak and Bakhit: Crawford suggests that the Fung-era fort at Khandak was built on the ruins of a Christian fort. A rough stone set of walls with semi-circular towers has been rebuilt with wall extensions and buttresses of unburnt brick. A similar fort is at Bakhit, where 18 semi-circular towers are set at the corners and at regular intervals along the wall. Lepsius identified Bakhit as a Christian site with a small church in the centre. The main walls are 30 feet thick and consist of rough stone on a core of unburnt mud-brick. The plan is rectangular and the whole site is covered with Christian potsherds. Al-Kab The two “castles” of al-Kab were first recorded in the 1820s by Caillaud and Linant de Bellefonds. The southern fort is a small post-Christian work, but the larger stone and brick structure to the north is one of a type of Christian fort that is also found at Bakhit and the Kubinat  (discussed below), and at Sai Island. The mud-brick may have been a post-Christian restoration, but the entire work was in a ruinous condition by the early 19th century. The plan is that of an irregular rectangle and features six semi-circular bastions. The rocky interior was filled with circular stone dwellings. Al-‘Usheir About 20 miles south of Baqeir is a fort that resembles al-Koro in having an inner enclosure accessible only from a large outer enclosure. A third enclosure seems to be a late addition and has no apparent entry to either of the older enclosures. In front of the south wall and the south-east gate are the remains of a lower rampart and fire-step outside the main wall, a defensive device known from the Middle Kingdom forts in Nubia. On the flat ground east of the castle is a chevaux-de-frise of pointed stones  designed to impede a rushing force of attackers. Bastions, curiously constructed in layers, are set at irregular intervals on the main wall. Around the inner enclosure are a parapet-wall and parapet in the places where the approach is not protected by the steep cliff on the north and east sides. This enclosure must have served as the castle-keep. The architect of the al-‘Usheir fortress displays a knowledge of mediaeval fortifications as practised in Europe and the Near East, though certain fundamentals had been in place since the construction of the Middle Kingdom forts. The Christian dating is provided by the many inscribed sherds on the site. The dating of Jabal Nakharu must be regarded as tentative. The ruinous condition prevents determining whether the bastions were semi-circular (as in Christian forts) or rectangular (as in post-Christian works). Red bricks are not in evidence at the site and the collection of painted sherds made by Crawford was subsequently lost. The Kubinat site is an enormous work in a highly barren area – each fort encloses an area of about three acres. The walls are ten feet thick and about 18 to 20 feet high. The forts and their environs are covered with Christian and imported Roman pot-sherds. Typical Christian red-brick is present, as are earlier bricks of Meroitic type. Querri The kingdom of Alwa seems not to have relied upon great fortifications, although some of the fortresses previously described as Makurian may have been works of Alwa, depending on when and where political boundaries were drawn. A system of defenses is noticeably lacking at the capital of Soba. Distance from powerful external threats and a highly mobile army may have sufficed to preserve Alwan power until the Arab migrations into the region began. Most of the fortified Nubian sites dealt with in this paper belong to the Late Christian period, when external threats from the north endangered the existence of the Christian kingdoms. 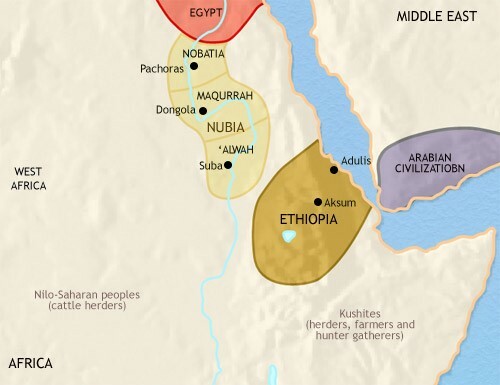 The traditional reaction of the Nubians to raids from the north was dispersal or concentration of the population. The proliferation of fortified sites may have seen the balance shift in favour of the latter strategy in Late Christian times, when the expiry of the Baqt Treaty renewed the northern threat. The Muslim invasions had been highly destructive in 641 and 651-2 C.E., when the Christian kingdoms lacked effective defensive works. The invasion of Shams al-Dawla in 1172-73 C.E. and the seizure of Qasr Ibrim was a reminder of the necessity for strong defensive works. Jabal Adda and Qasr Ibrim became important sites of authority in the Late Christian period, able to offer refuge to the civil population in a crisis. Many of the settlements of the Classic Christian population in Lower Nubia show no signs of occupation after the 12th century , while Jabal Adda and Qasr Ibrim were the centers of an expanding population. The walled settlement of the early Christian period gave way to the two-storey building, which, despite its elusiveness of purpose, must have played a strong role as a watchtower, a secure place for the storage of goods and a temporary refuge for the local population. These towers were often a type of keep within a defensive wall, but there are cases of two-storey houses outside the town-walls. The mobility of the Arab and African tribes precluded the old tactic of population dispersal and inspired a new form of defensive architecture that included the two-storey house/blockhouse in Lower Nubia. Further south in Makuria, especially upriver from Dongola, a more centralized means of defense evolved in which the resources of the state were devoted to the construction of massive forts rather than the small-scale community defenses of the north. The Late Christian emphasis on military rather than religious architecture may reflect, if not an increasing secularization of Nubian culture, at least a weakening of its Christian component. As fortifications grew larger and more complex, the great churches and cathedrals were no longer being built, replaced by ever-shrinking and impoverished religious architecture. The fort/castle became the symbol of authority, meeting the urgent needs of the present, rather than those of the hereafter. The role of feudalization in Late Christian society is uncertain; for example, did the two-storey houses belong to feudal lords or the community at large? What role did the defenses south to the 6th Cataract have in the governance or repression of the citizenry? Was command centralized or local? Were the commanders of defensive works of local origin or appointed by the King and his agents? In the larger fortresses of the south we have no idea of the make-up or origin of the garrisons, or even if they had permanent garrisons at all. Some sites may have been intended as sanctuaries for the civil population, but would be largely ineffective without trained defenders capable of making sorties to secure supplies or disrupt offensive operations. Forts such as those of the Kubinat must have had permanent garrisons due to their isolated location, but the problem of supply must have been a difficult one. The known history of the fortifications of Christian Nubia reveal that the most effective defense ever constructed by the Nubians was the Baqt Treaty negotiated with Egypt. At the time of its expiry, control of the Nile trade routes was rapidly diminishing in importance. The arrival of the Bani al-Kanz and their camel caravans brought an end to the prosperity of the Nile’s fortified customs houses as the caravans could set out from Egypt across unpatrolled desert routes, touching back upon the Nile wherever desired. 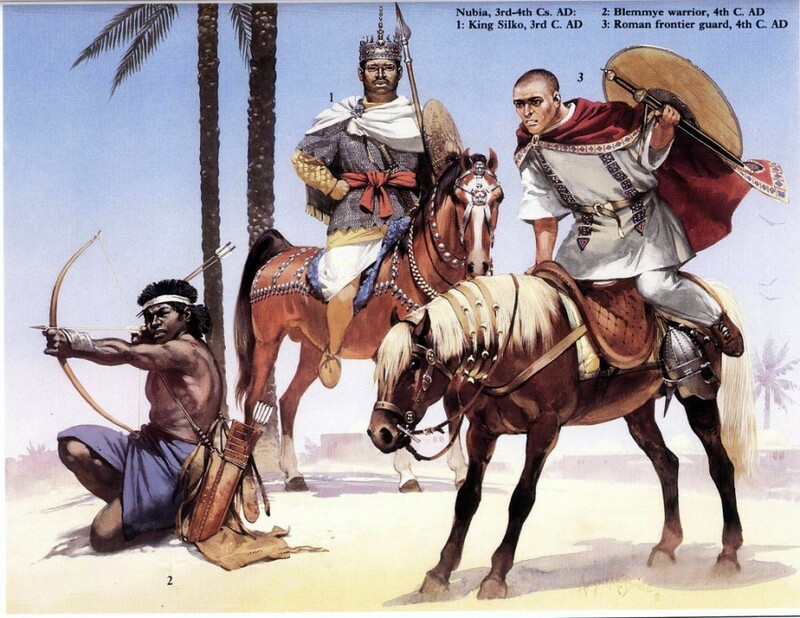 The Mamluks, combining rapacity, ferocity and advanced military tactics, were more than a match for the Nubians. They penetrated the Christian defenses at will, taking Dongola in 1276 C.E. and again in 1289 C.E. Most telling is the record of the 33-day Mamluk pursuit of King Shenamun upriver from Dongola in which only Mamluk two soldiers died – one in combat while the other drowned. Most effective of all, however, was the peaceful penetration of Christian Nubia by Muslims and their usurpation of the old inheritance system. Against this type of social transformation the great fortresses of Christian Nubia were helpless. W.Y. Adams: Nubia – Corridor to Africa (2nd ed. ), Princeton N.J., 1984, p.493. P.F. Velo: “Les Fouilles de la Mission Espagnole à Cheikh Daoud,” in Fouilles en Nubie (1959-61), Cairo, 1963, p.28. A.J. Mills and H.A. Nordstrom: “The Archaeological Survey from Gemai to Dal – Preliminary Report on the Season 1964-65,” Kush 4, 1966, p.15. A. Vila: La Prospection Archéologique de la Vallée du Nil, au Sud de la Cataracte de Dal (Nubie Soudanaise), Fasc. 2, Les districts de Dal (rive gauche) et de Sarkamatto (rive droite), Paris, 1975, p.29. A. Vila: La Prospection Archéologique de la Vallée du Nil, au Sud de la Cataracte de Dal (Nubie Soudanaise), Fasc. 6 – Le district d’Attab, Est et Ouest, Paris, 1977, p.32. A. Vila: La Prospection Archéologique de la Vallée du Nil, au Sud de la Cataracte de Dal (Nubie Soudanaise), Fasc. 3 – District de Ferka (Est et Ouest), Paris, 1976, p.50. Ibid, p.90; W.Y. Adams: “Castle-Houses of Late Medieval Nubia,” Archéolgie du Nil Moyen, vol. 6, 1994, p.14. W.Y. Adams: “Sudan Antiquities Service Excavations in Nubia: Fourth Season, 1962-63,” Kush XII, 1964, p.222. Adams, op cit, 1994, p.13. Mills and Nordstrom, op cit, 1966, p.14. Vila – Fasc. 2, op cit, 1975, p.62. G. Donner: “Preliminary report on the Excavations of the Finnish Nubia Expedition 1964-65,” Kush 15, 1967-68, p.233. A. Vila: La Prospection Archéologique de la Vallée du Nil, au Sud de la Cataracte de Dal (Nubie Soudanaise), Fasc. 10 – Le District de Koyekka, Les districts de Morka et de Hamid – L’île Nilwatti, Paris, 1978, p.81. T. Säve Söderbergh: “Preliminary Report of the Scandinavian Joint Expedition – Faras-Gemai, 1963-64, Kush 15, 1967-68, pp.235-37. N.B. Millet: “Gebel Adda Preliminary Report, 1965-66,” JARCE 6, 1967, p.62. W.Y. Adams: Kulubnarti I – The Architectural Remains, Lexington Kentucky, 1994, pp.81-83. Adams, op cit, 1984, p.518. Adams, op cit, 1994, p.14. The Excavations at Faras – A Contribution to the History of Christian Nubia, Bologna, 1970, p.113. Adams, op cit, 1984, p.513. “Antiquities of the Batn el Hajjar,” Kush 5, 1957, p.45. A. Vila: La Prospection Archéologique de la Vallée du Nil, aud Sud de la Cataracte de Dal (Nubie Soudanaise): Fasc. 4 – District de Mograkka (Est et Ouest); District de Kosha (Est et Ouest), Paris, 1976, p.101. J. Vercoutter: “Excavations at Sai, 1955-57 – A Preliminary Report,” Kush 6, 1958, pp.144-69. O.G.S. Crawford: The Funj Kingdom of Sennar, Gloucester England, 1951, p.37. Y.F. Hasan: The Arabs and the Sudan, Edinburgh, 1967, p.20. Godlewski, op cit, 1991, p.109. J. Vantini: Oriental Sources Concerning Nubia, Heidelberg, 1975, p.92. J. Vantini: Christianity in the Sudan, Bologna, 1981, p.92. Godlewski, op cit, 1991, p. 111. Crawford, op cit, 1951, p.44. Vercoutter, op cit, 1958, p.160, fn.72. Crawford, op cit, 1951, p.50. O.G. S. Crawford: Castles and Churches in the Middle Nile Region, SAS Occasional Papers, no.2, Khartoum, 1961, p.9. G.W. Titherington: “The Kubinat – Old Forts in the Fourth Cataract,” Sudan Notes and Records 22, 1939, p.270. Mohi el-Din Abdalla Zarroug, The Kingdom of Alwa, Calgary, 1991, p.62. Hasan, op cit, 1967, p.128. H.N. Chittick, “Antiquities of the Batn el Hajjar,” Kush 5, 1957, p.272. Adams, op cit, 1984, p.539. Adams, op cit, 1984, p.511. Vantini, op cit, 1970, p.267. Hasan, op cit, 1976, p.115. Adams, William Y. : “Sudan Antiquities Service Excavations in Nubia: Fourth Season, 1962-63,” Kush XII, 1964, pp.216-47. Nubia – Corridor to Africa (2nd ed. ), Princeton N.J., 1984. “Castle-Houses of Late Mediaeval Nubia,” Archéolgie du Nil Moyen 6, 1994, pp.11-45. Kulubnarti I – The Architectural Remains, Lexington Kentucky, 1994. Chittick, H.N. : “Antiquities of the Batn el Hajjar,” Kush 5, 1957, pp. 42-48. Crawford, O.G.S. : The Funj Kingdom of Sennar, Gloucester England, 1951. Castles and Churches in the Middle Nile Region, SAS Occasional Papers, no.2, Khartoum, 1961. Donner, Gustaf : “Preliminary report on the Excavations of the Finnish Nubia Expedition 1964-65,” Kush 15, 1967-68, pp.70-78. Godlewski, Wlodimierz: “The Fortifications of Old Dongola – Report on the 1990 Season,” Archéolgie du Nil Moyen 5, 1991, pp.103-28. Jakobielski, Stefan: “North and South in Christian Nubian Culture – Archaeology and History,” in T. Haag (ed. ): Nubian Culture Past and Present, Stockholm, 1987, pp.231-35. Knudstad, J.: “Serra East and Doginarti,” Kush 14, 1966, pp.165-86. Millet, Nicholas B.: “Gebel Adda Preliminary Report, 1965-66,” JARCE 6, 1967, pp.53-63. Mills, A.J. : “The Reconnaissance Survey from Gemai to Dal – A Preliminary Report,” Kush 13, 1965, pp.1-12. “The Archaeological Survey from Gemai to Dal – Report on the 1965-66 Season,” Kush 15, 1973, pp. 200-210. Mills, A.J. and H.A. Nordstrom: “The Archaeological Survey from Gemai to Dal – Preliminary Report on the Season 1964-65,” Kush 4, 1966, pp.1-15. Monneret de Villard, Ugo: La Nubia Romana, Rome, 1941. La Nubia Mediovale (2 vol.s), Cairo, 1935. Plumley, J. Martin: “The Christian Period in Nubia as Represented on the Site of Qasr Ibrim,” in P. Van Moorsel (ed. ): New Discoveries in Nubia, Leiden, 1982, pp.99-110. Säve Söderbergh, T.: “Preliminary Report of the Scandinavian Joint Expedition – Archaeological Invesstigations between Faras and Gemai, November 1963 – March 1964,” Kush 15, 1967-68, pp.211-250. Shinnie, Peter L.: “The University of Ghana Excavations at Debeira West, 1964,” Kush 13, 1965, pp.190-94. Titherington, G.W. : “The Kubinat – Old Forts in the Fourth Cataract,” Sudan Notes and Records 22, 1939, pp.269-71. Vantini, John: The Excavations at Faras – A Contribution to the History of Christian Nubia, Bologna, 1970. Oriental Sources Concerning Nubia, Heidelberg, 1975. Christianity in the Sudan, Bologna, 1981. Velo, F. Presedo: “Les Fouilles de la Mission Espagnole à cheikh Daoud,” in Fouilles en Nubie (1959-61), Cairo, 1963. Vercoutter, J.: “Excavations at Sai, 1955-57 – A Preliminary Report,” Kush 6, 1958, pp.144-69.